Jasper Rine is Professor of Genetics, Genomics, and Development at the University of California, Berkeley as well as an HHMI Professor. His lab studies yeast and human genetic and epigenetic variation to understand gene silencing. In addition to serving as the 2015 GSA President, he is a reviews editor for GENETICS and an associate editor for G3. 2015 has been a very important and productive year for the GSA, with much progress on issues critical to our community. Following the incredible success of YeastBook in GENETICS, the GSA has just launched FlyBook, with Lynn Cooley as Editor-in-Chief—and will soon launch WormBook with Iva Greenwald as Editor-in-Chief. Innovative online chapters provide comprehensive reviews on contemporary areas of research on these organisms. To enhance the public perception of basic research in genetics and speak on behalf of model organisms, we are engaging the Public Policy Committee and added Allan Spradling as its chair. Allan and his committee represent the interests of GSA members, including at the meetings and hearings in Washington, D.C. that influence critical decisions. You may have already seen a blog post by Allan on gene drives and reports from Chloe Poston, GSA’s Policy and Communications Manager, on gene editing, GMO regulations, and more. Stay tuned for lots of additional action on the advocacy and outreach front. In addition to hosting several conferences each year that bring communities together, we have organized the first unified genetics conference for next summer, which I call the Totally Awesome Genetics Conference (TAGC). (Its “real name” is The Allied Genetics Conference). We expect around 4,000 attendees across seven co-located meetings. Jeannie Lee and Phil Hieter, co-chairs of the TAGC Coordinating Committee, along with an all-star team representing the participating communities, have put together a compelling set of cross-cutting sessions with world-leading geneticists as plenary speakers. And because of tough negotiations by GSA’s meeting coordinators, TAGC is an incredible bargain for its attendees. Don’t miss our gathering! The Board continues to advocate for policies to ensure continued support for the oh-so-critical Model Organism Databases. Problems remain, but we are working with NIGMS Director Jon Lorsch, NHGRI Director Eric Green, and GSA members on the advisory councils for various NIH Institutes to make the importance of these databases clear to the Institute Directors. These databases matter to many members of our community, and GSA is pushing on your behalf so that model organism databases remain robust. At every opportunity, we continue to promote the critical importance of investigator-initiated research for the vitality of the US research enterprise. For example, Executive Director Adam Fagen and I published the first analysis of research funding of GSA members in the August issue of GENETICS. The Society launched a new program to support GSA Trainee-Organized Symposia—three of which are debuting this academic year thanks to the energy and creativity of our student and postdoc members—and has issued a call for the next series (the application deadline is January 10). We unveiled our new Genes to Genomes blog (G2G), which provides a forum for the community to discuss issues and news of interest to our members. This is the only blog that I subscribe to and I enjoy every post. The incoming GSA President, Stan Fields, is planning to contribute semi-monthly posts to the Genes to Genomes blog. I guarantee you will not want to miss these articles, so be sure to subscribe. 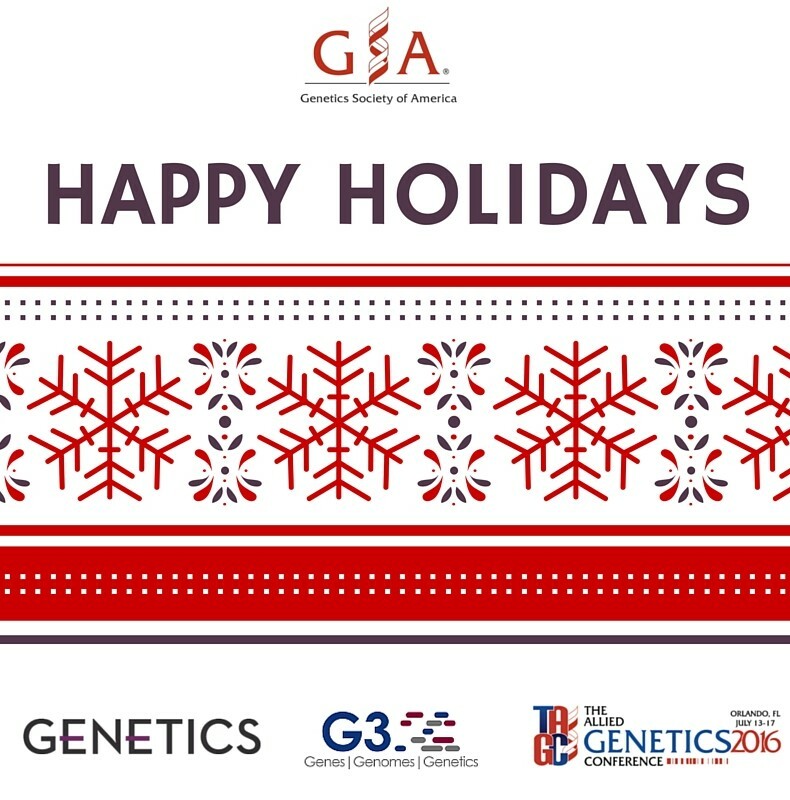 And if you want to contribute to G2G, send your ideas to blog@genetics-gsa.org. The GSA publishes two peer-edited scholarly journals, whose influence continues to rise. In 2016, GENETICS will be celebrating its first century of publication—all of which is accessible to you online — back to the first paper of the first issue. G3: Genes|Genomes|Genetics, our open access journal, continues to flourish and has already become the go-to place for publishing original, useful research in our field. My experience with publishing papers in both of these journals has been a pleasure. Yours will be too! Soon, we’ll announce the recipients of the GSA awards for 2016. Be sure to send your congratulations to this remarkable selection of scientists. Equally important, be sure to submit your nominations for other deserving recipients for next year’s awards. They can’t win unless they are nominated. Finally, as my term as GSA President draws to an end, I thank the members of the Board of Directors and Past President Vicki Chandler for their support and guidance this past year and their work for all of us. I am thrilled that Stan Fields, who as incoming President has worked closely with me all year, will take over the reins on January 1st. He has shared a few of his exciting plans with me, and I think he will bring the GSA to the highest level of national and international recognition yet. I would like to thank the GSA staff who work, often behind the scenes, to make your Society better and strong. Most importantly, I want to thank our thousands of members, volunteers, donors, journal authors, editors and reviewers, conference attendees, and more for their trust in the Society and for supporting our efforts to strengthen our voice on behalf of the genetics community. Happy holidays to all as you enjoy the season with friends and family. Don’t miss the next issues of GENETICS and G3: Genes|Genomes|Genetics, and I look forward to seeing you at TAGC this coming July.